So this piece is very different than what you typically find out there. It’s a re-heralding of the age of e-Magazines and it’s so well done. It’s infinitely better than the ones you would find back in the 90s and early 2000s. For review purposes I’m only going to give stars to the work as a whole, and each fiction story within. There is also an opinion piece, interview, and artist feature that are fabulous. I’ll include my thoughts on those but not stars. This was a very interesting look at where people draw the line between “author” and “writer” and the subtle distinction between the two. Now of course this is all Angel’s opinion. However she brings much truth to the table. Sure, many authors want to be able to quit whatever day job they’ve got, write full time, and become the next New York Times best seller. But as long as you’re enjoying writing, people are buying your books, and you’ve got more ideas? Keep on keeping on. WOAH! Holy surprise ending. I was not expecting it at all. There are so many hints and little breadcrumbs leading you to the ending. You kind of get a feeling what’s happening before things are revealed. But boy that twist at the end is GOOD! I loved the storytelling and writing style. I’m definitely going to be checking out more by this author. Cute little story! I liked how devoted Matty was to his dog and the other dogs at the doggy day care. Johnno was sweet and very interested in Matty. I loved how they used their dogs as a reason to get to know each other and build trust and a relationship. Such a super cute happy ending too! I recently discovered Catherine’s work. Actually, a few weeks before this spotlight. She does beautiful work for authors, bloggers, and her own art. I definitely suggest you checking out her stuff if you haven’t already. In this piece she gives us a little of where her inspiration came from for multiple works she’s done. I enjoyed reading how she got her start in the cover art part of what she does. Plus her pride bunnies Skip and Pip are so much fun. They get into some interesting situations for sure! Holy moly, did not expect the twist at the end of this one. The character showed so much compassion. Such a wonderful story. I felt horrible that the character lost their dad. The man their mom is dating is a total loser and does nothing to hlep out. I’d love to read more by this author in the future! Oh man, the emotion! Tony and Jake were so beautiful together. They both gave up so much to be together and help each other. The ending is bittersweet but there isn’t a way to have a happy ending when one of the characters is dying from cancer. But there’s a little bit of hope at the end that Jake is happy where he is. I loved their opinion on how Science Fiction/Fantasy has grown over the last few years and the LGBT side of SFF can stand alone alongside mainstream SFF without the romance piece. As a reader, yes, I want romance even if it’s not the main point, plus a happy ending. But if authors deal more with the world and conflict and character growth, gotta say that’s a wonderful prospect to look forward to. And now I want the avian anthropomorphic romance she’s talking about. Right now! Please! J. Scott Coatsworth joins us today to talk about a few things he’ll never do again. His list is pretty funny, though some of them I have to agree we should never ever do. Read and enjoy! As a writer who specializes in MM stories and magical realism, I’ve done many things in my life – how can you write about something if you’ve never done it? 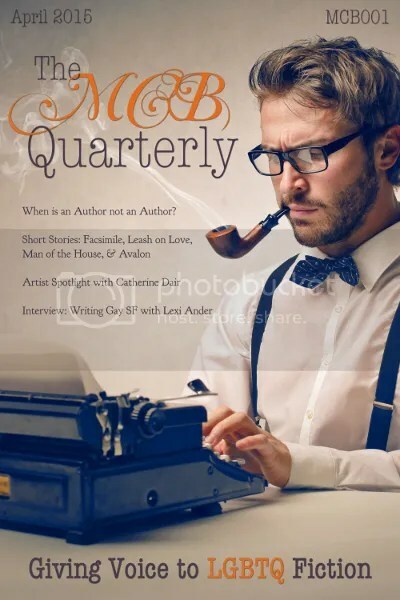 Although I do borrow from friends and families occasionally, as I did from my husband, Marco’s experience losing his partner, Frank, when I wrote Avalon for the MCB Quarterly. And I would certainly do a lot of those things again. But there are a few that I would never, ever try a second time. Or so I tell myself. So here is my list of things I will never do again. Mix vanilla ice cream, salsa, and circus peanuts. And eat it. Kiss a girl. That way. With tongue. Submit a story to an anthology without reading the call for submissions thoroughly enough to discover that the story was supposed to be set in another country. Sell my soul for an Oreo. Fly through Chicago O’Hare in the winter. Buy twenty boxes of Girl Scout Cookies. And then eat them all. Buy a white car just because they offer me the “wrong color discount”. Fly to Italy. Coach. Changing planes three times. Agree to write a list of ten things I’ll never do again. I reserve the right to take any of these things back at any time. After all, you only live once. Tony wheeled the chair down the long ramp to the beach, hoping it wasn’t too hot or too cold for Jake’s skin. The day itself was wonderful, the clearest in weeks, and the Pacific Ocean waves pounded the beach in a steady, soothing rhythm that he hoped even Jake could hear. Soon they were on level ground, negotiating the boardwalk that ran up and down this part of the beach. Jake had a sloppy smile on his face. Tony smiled to himself. There were so few pleasures he could give Jake anymore. The man deserved so much more than this. His lover didn’t respond, but only stared ahead, smiling. There were still periods of lucidity, to be sure, but they were farther and farther apart. Sometimes Tony wished that Jake would finally succumb to the growth in his head and be at peace. But only sometimes. More often, he treasured the time they still had together and remembered the strong, vital man Jake had been when they’d first met. For just a moment, the rest of the world faded away, and they were alone together on a quiet, windswept beach. Tony breathed in deeply, savoring the pure sweetness of the salty ocean air, the wash of clean colors that assaulted his vision. He glanced up at the road above, only to find it was gone. There were no other people on the bluff, no buildings, nothing. They were alone, really alone, in this little corner of the world. Tony shook his head to dispel the vision. It was the late nights, he thought, the lack of sleep that led to these strange imaginations. A hand came down on his shoulder. Hard. And suddenly they were back among the bustle of a thousand other people. This entry was posted in Guest Post, Reviews and tagged Artist: Catherine Dair, Author: Angel Martinez, Author: Beany Sparks, Author: Brigid Collins, Author: Freddy MacKay, Author: J. Scott Coatsworth, Author: Lexi Ander, Author: Mina MacLeod, Bittersweet, Contemporary, Contest, Dogs, F/F, Fantasy, Gay, HEA, Historical, Lesbian, Location: California, Location: Paris, M/M, Magazine, Pets, Rating: 4.5 stars, Rating: 5 stars, Science Fiction, Surprise Ending. Bookmark the permalink.